Click here to complete your registration by filling out REGISTRATION FORM. Early bird registration $800 through May 1st. $900 after May 1st. Performances are August 3, 4, 5, and 6th. For information or to apply for scholarships and financial assistance contact: Rachel Silverman at mizsilverman@gmail.com or (413) 626-1976; or Jonathan Diamond at jonathan@crocker.com or (413) 387-8783. The Hilltown Youth Theatre Summer Workshop is the flagship of our youth programming. The Workshop provides much needed, high quality, intensive arts experiences for young people in one of Massachusetts’ most rural areas. 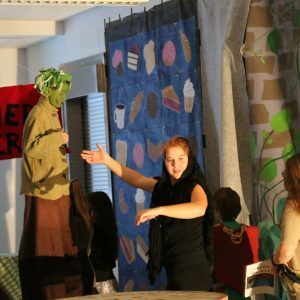 For the past seven years, through artistic excellence, exemplary work with young people and a commitment to building a supportive community for youth, the Workshop has helped young people develop personally and artistically through professional caliber, community-centered theater. The program brings together student-performers from all over the region to train and collaborate on theatrical productions at a high level. 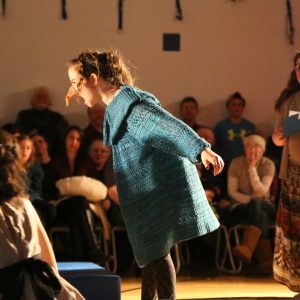 It is part of an effort to use theater to create a larger sense of community that transcends buildings and school campuses and instills in young people a sense of place and appreciation of hilltown life and passion for the arts. We incorporate movement, puppets, mask making, voice work, circus arts and work on large apparatus (e.g., stilts, aerial fabrics, spools, flying trapeze, etc. ).